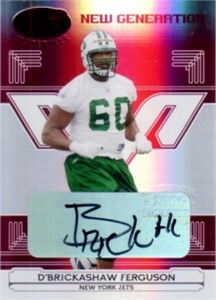 2006 Leaf Certified Materials certified autograph card of New York Jets top draft pick D'Brickashaw Ferguson. #90 of only 250 produced. ONLY ONE AVAILABLE FOR SALE.